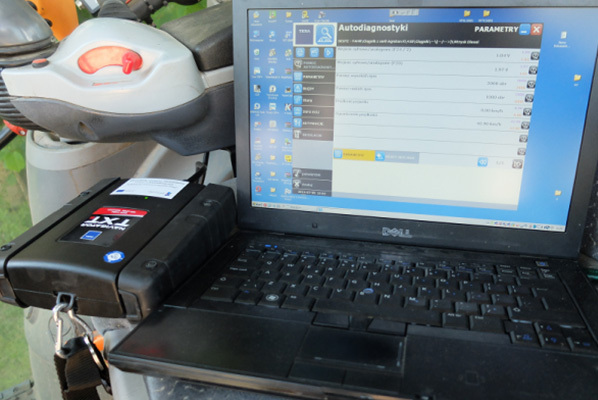 Modern tractors equipped with engine computers have the ability to carry out computer diagnostics, which makes it easy to locate the fault and verify the technical condition of the tractor. Our company has specialized diagnostic equipment that allows you to read/erase errors, analyze engine parameters (fuel pressure, boost pressure, sensor check, etc. ), perform test procedures and perform calibration adaptations after parts replacement. Due to the fact that we have PTO dynamometers, we are able to analyze the data in real load mode, which allows us to verify complex problems that occur only at specified load and speed. Computer Diagnostics is one of the most important steps our company performs before the power increase service. On the basis of this and the measurement on the dynamometer, we decide how and to what extent we will increase the power in the given tractor.